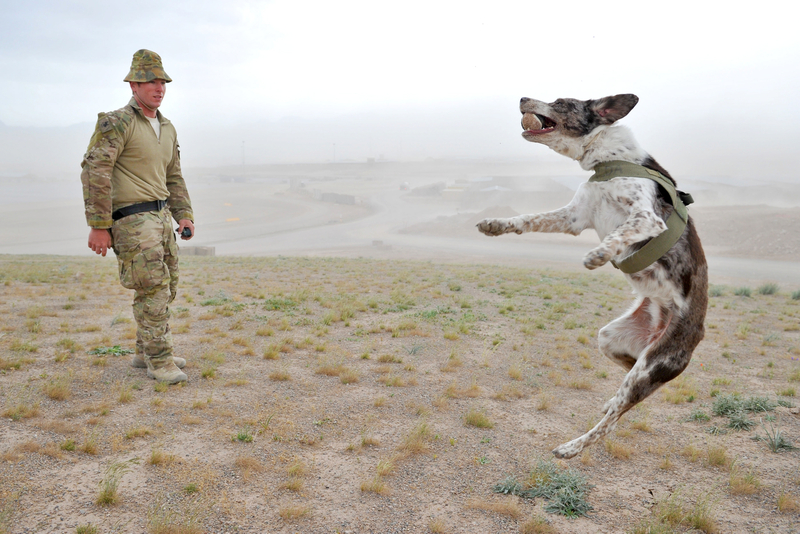 This amazing mid-air shot of Australian Explosive Detection Dog, Matilda, was too good to pass up. Matilda is deployed to Tarin Kowt, Uruzgan, with her handler Sapper Adam Thomlinson as part of Mentoring Task Force 4 (MTF-4). In 2010, then Minister for Defence, Senator Faulker, announced additional counter-IED initiatives, including $4.9 million to begin training additional dogs. The cost to maintain an EDD annually is $90,000. Photo by Corporal Mark Doran, Department of Defence. This entry was posted in ADF, Afghanistan, Australia, Dogs, Uncategorized by Natalie Sambhi. Bookmark the permalink.